Tate announces today that Pamela Joyner will succeed Jeanne Donovan Fisher as Chair of the Tate Americas Foundation for a five year term starting on 1 April 2018. 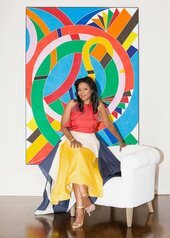 Ms. Joyner is a Trustee of The Art Institute of Chicago, the J. Paul Getty Trust and the Tate Americas Foundation, and a member of the Tate International Council and the Tate North America Acquisitions Committee. She is also a Member of the Director’s Circle of the San Francisco Museum of Modern Art and a Member of the Modern and Contemporary Art Visiting Committee of the Metropolitan Museum of Art. In the education arena, Ms. Joyner serves on the board of the Art & Practice Foundation. Previously, Ms. Joyner’s philanthropic involvements have included serving as: a member on President Obama’s Committee on the Arts and Humanities; a Trustee of Dartmouth College and Chair of the Investment Committee; a Trustee of the New York City Ballet; a Board Member of the School of American Ballet; a Trustee and Co-Chair of the San Francisco Ballet Association; a Board Member of the MacDowell Colony; and a Trustee of the Asian Art Museum as well as other arts and educational organisations.